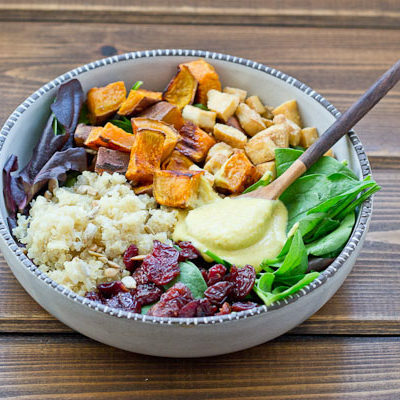 This Veggie Power Bowl topped with Cashew Honey Mustard Dressing is just what you need after a workout. It’s power-packed with quinoa, sweet potatoes, dried tart cherries, spring greens, roasted tofu, and sunflower seeds that will keep you fueled and speed recovery. Preheat oven to 425 degrees F. Line rimmed baking sheet with parchment paper. Arrange tofu and sweet potatoes on sheet; coat with coconut oil and cinnamon. Bake for 30 minutes. Meanwhile, soak cashews in water for at least 15 minutes. Place cashews in food processor and process until ground. Add yellow mustard and honey to food processor and process until combined. Slowly pour in water and continue to process for a minute or so until dressing is formed. Add paprika to food processor and give it a quick whirl in the food processor to combine. To assemble the power bowls, add 1 cup lettuce to each bowl. Top each bowl of lettuce with ½ cup quinoa, ½ sweet potato, 3 ounces tofu, ¼ cup dried tart cherries, and 1 tablespoon sunflower seeds. Drizzle 1-2 tablespoons of dressing.